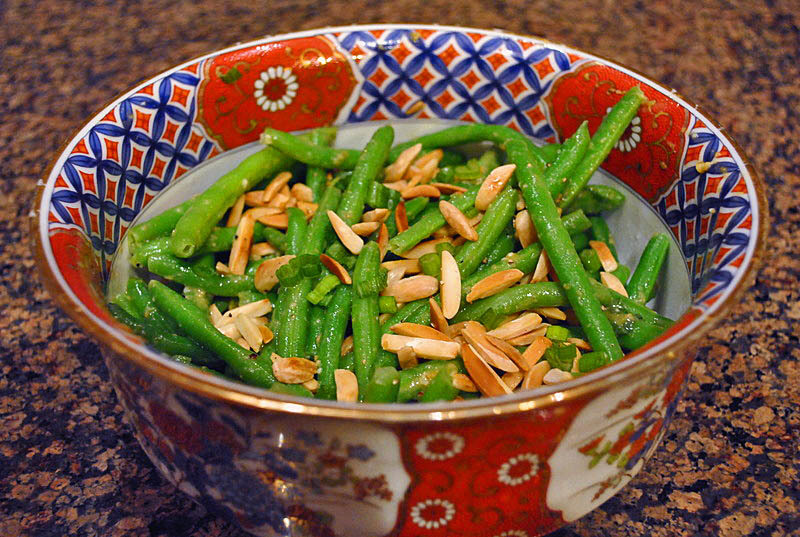 Green beans show up at our dinner table once a week, most of the time in a quick preparation with slivered, toasted almonds. It’s nice to have some recipes that you can almost pull on your sleep. This version from Bon Appetit is almost as simple, but feels a lot more special because it uses miso. I suppose it’s the funk factor, that umami component that adds extra flavor. Try this recipe, even if you don’t normally use this Japanese gem in your cooking. You’ll love it, I am sure. Cut green beans in pieces 1 to 1.5 inches long. Cook them in a large pot of boiling salted water until crisp-tender (less than 5 minutes). Transfer to a large bowl of ice water to cool. Drain well. Whisk miso, vinegar, mustard, oil, and sugar in a small bowl. Season with salt, but very lightly because miso is already salty. Place green beans in a large bowl. Pour dressing over; toss to coat. Garnish with almonds. I always have miso in the fridge. It keeps for a long time, and shows up more and more in recipes everywhere. I often add it to sauteed mushrooms, but green beans match equally well with the sweet-saltiness of miso. Yin and Yang. Gotta love it! This dish is a great side for chicken, salmon, steak, or pork. And leftovers are excellent even at room temperature. A very interesting use of miso. I make miso soup, of course, with white or red miso, but I’ve never applied it to a vegetable dish. I’m looking for ways to use up the miso in my cabinet! And a new veggie recipe always sounds good to me. Love this! We’ve never tried anything like this. Miso soup and that’s it. What a great idea. It looks delicious. I guess I need to purchase some Miso! I don’t normally purchase it, but you’ve now changed my mind. Green beans have been in my market lately and I’ve been picking up a bag each week so I’m thrilled to have a new recipe to try. I love finding more ways to use miso! I also love finding different ways to season green beans. This is a win, win. If you’ve never used miso with veggies, I highly recommend trying mushrooms first as a ‘warm up’ – it is absolutely delicious, I like to sautee a mixture of regular mushrooms and porcini (just a touch of those), then add a little miso thinned with water if necessary. Oh, pure heaven! I love this idea and we love green beans. Need to eat them more. I bet this would be excellent on snow peas too – or snap peas…. I love green beans, too. I never tried miso 😦 I have to see if I can find here, or I’ll buy it from Paris, on my next trip there. Mmm… what a delicious bean vinaigrette and I agree, the miso does make it extra special. It’s nice to have recipes that are relatively easy to pull together yet a bit different from the usual – not to mention nutrient rich – very nice Sally! yum! the vinaigrette is just calling my name. adding miso is just genius! This sounds like a wonderful way to use miso. Thanks for the inspiration! That looks very fresh and vibrant as well as extremely good for you. Great use of miso.